The popular food truck Casey’s Pizza has officially opened at 1170 4th Street, a mere two-minute walk from ONE Mission Bay! We’re excited to have a neighbor who offers some of the best old school pizzas in the city. With their location right next to the ever-popular Reveille Cafe, Casey’s Pizza will be serving up fan-favorites including their Margherita and Zoe pies, alongside new menu items like the Lil’ Gem Caesar salad and ice cream sundaes with fresh, seasonal toppings. Beer on tap will be available, as well as a wine selection that will perfectly complement the meal. Garnering a cult following as San Francisco’s first pizza truck, Casey’s Pizza’s brick-and-mortar location will also be offering more styles of their famous Neapolitan, New York-inspired pizzas now that they have ample kitchen space. 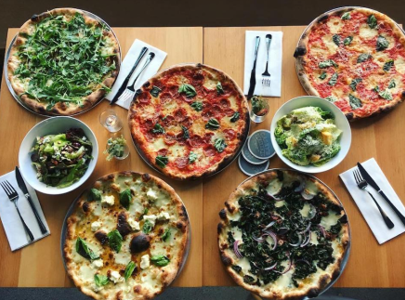 This dinner destination is sure to be a hit within the Mission Bay community and add even more standout dining options for the residents of ONE Mission Bay. Open Tuesday to Sunday, 5-9pm.